Since our foundation, we have been committed to supporting local school children in the jungles surrounding Siem Reap. By assisting in purchasing school supplies and delivering nutritious food and clean water, we are helping to pave the way for a brighter future in the heart of Cambodia. Our mission is to help neglected schools receive the critical support they need by constantly assessing the needs of attending children and fulfilling those needs to the best extent possible. We believe that by giving children the tools they need to receive a better education, and by ensuring they receive nutritious meals and clean water each day, we can make an impact in their lives and on the future of Cambodia. Our goal is in helping poor and underfunded school children receive school supplies, clean food and water, and basic gym equipment to promote healthy social relationships. Schools surrounding Siem Reap are constantly in need of assistance, with many children unable to receive basic school supplies due to a lack of government funding. For most Cambodian Families, purchasing school supplies isn’t possible when money must be spent to feed their families. Additionally, because of the recent boom in tourism surrounding Siem Reap, most children are forced to work after their classes have ended. Along with providing tours throughout Angkor Wat and its temples, we also provide daily excursions to rural schools where any sort of assistance from you can make a huge impact on the children attending. After touring the beautiful and ancient temples built by the Khmer People, spending just half a day at one of these schools is a great way to make a memorable impression on your vacation. A tour like this would start with a visit to the local wholesalers market where you can pick from hundreds of shops to select the items you would like to donate (Items like notebooks can be purchased for 10 cents, packs of colored pencils for less than 25cents). We would then journey into the jungle on the outskirt of Siem Reap to schools where you can meet the children, hear from their teachers and experience the liveliness of classrooms filled with students eager to learn. It is a terrific moment to include in your travel plans! Additionally, if you would like to donate without visiting the schools, please contact us for more information about supporting the future of Cambodia. 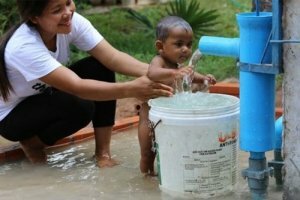 The Cleaning Water Project is a Way to Leave a Lasting Impression There is almost no need as basic as having clean water to drink, but many Cambodian people do not have access to it. In the countryside, most people rely on water from rivers or streams, but this water is often diseased and polluted. Many of the country’s worst health problems can be traced back to the use of these unclean water sources. The victims of these diseases are often children, whose parents have no way to pay for medical care. It is estimated that 60% of rural residents have no clean water to drink. The good news is that this problem is easily fixed for individual families with the installation of a well. A properly installed well can ensure that the family will have drinking water for many years and a greater chance of health and prosperity. The cost of making such a big difference is only 300 USD. When my customers see the beauty of Angkor Wat and the very difficult lives of the people who live near it, they often ask how they can help. I want to suggest that paying for even a single well to be installed can truly change the lives of those Cambodians who are most in need. What makes this an extraordinary giving opportunity is that you will meet the people who receive your well and see firsthand where your donation is going Together we will go to the countryside, meet a rural family, hear their stories, and assist in the installation of their new well. If you are interested in giving Cambodian people cleaning water and a fresh start, please tell me when you book your tour so I can make the proper arrangements before you arrive. Thank you for your generosity! It costs only 300USD to install a cast iron pump well and this will provide clean water for 3 families for the next 15 years. It is a really humbling experience to learn that our small contribution can make such a huge impact on the lives of these families. Additionally, if you would like to donate without visiting the villages, please contact us for more information about supporting the future of Cambodia. For those that continue to provide their support after leaving Cambodia, Thank You!! !